Elevated decks maximize your enjoyment of outdoor space around your home. They’re especially popular on houses with a walkout basement, but can also be used where there is no walkout to create an upper deck accessed from the second story. Any type of material can be used to create an elevated deck, from affordable pressure-treated lumber to durable aluminum or plastic to exotic ipe or tigerwood. If you’re unsure of what material you will use for your elevated deck, take a look at our deck guides. They include pricing for the materials, installation and repairs for all of the most common deck materials. There are pros & cons of each too, so researching your options and comparing them head to head is fun and easy. 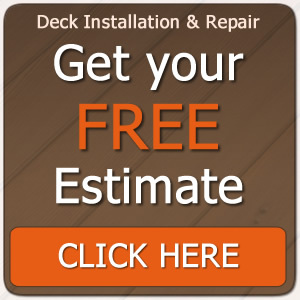 Finally, if you’d like to receive written deck estimates on any style deck from some of the top contractors in your area, we invite you to use our free service. The deck builders are prescreened, and they understand they’re competing for the work. It’s a great way to find qualified contractors with excellent experience and competitive prices, and there is no obligation. An elevated single deck is most common on homes with walkout basements, but not exclusive to them. Often, a patio is installed outside the walkout basement door and beneath the deck. This is a cost-effective way to get two usable spaces. Sometimes the ground is simply left bare, especially when the area immediately inside the walkout door isn’t living space. Two decks, a lower and an upper, are popular on two-story homes when the top level has a door that can be used to access the upper-level deck. If the home is a two-story with a walkout, then your options are increased. Thinking through these issues will help you plan for an elevated deck that will be an asset to your home and one you’ll thoroughly enjoy. Such a deck will help you market your home should you decide to sell it. Deck access: If you’re elevating a deck to reach a second story or above, does that level of the home have an access door? If not, it will have to be reached by a stairway, and that will be a considerable extra expense. Or, an access doorway will have to be cut into the home. Either way, factor the cost into your planning. If you’re building a home rather than fitting a deck to an existing home, the expense of an access door will be minimal because it can be planned into the design. Privacy vs. convenience: If you’re planning to build an elevated deck to be accessible from a master bedroom, do you want a stairway to it or would you prefer being able to reach the deck only from inside the home? Each has its pros and cons. A stairway offers the convenience of being able to access the deck from outside as well as inside. It’s also a safety feature –a way to safely exit the home from the second floor in an emergency. On the other side of the debate, there is something appealing about being able to access the deck only from the bedroom. It provides privacy, a space all to oneself. Safety & Security: If the deck will reach a second floor or higher, do you want it to extend to the space outside of the bedrooms of kids or guests? While having the extra square footage on the deck is nice, there are obvious security issues to consider. This is especially true if the deck will have a stairway. Solid ceiling construction: If you want to make the most of the space below the elevated deck, consider installing a solid ceiling that will keep rain off the area. To do that, you’ll need to install a drainage, gutter and downspout system attached to the bottom of the upper level. This will cost from $7 to $15 per square foot, depending on how you finish it. The advantages include having a dry place in the rain or a shady spot in intense sun from which to enjoy the outdoors for meals or leisure. You’ll also be able to use the space for the storage of firewood, gear or recreational equipment where it will be protected from the elements. Your climate: The nicer your climate is, the more bang you’ll get for your decking buck. In other words, a single or two-story deck will get more use in Florida or Texas than it will in Michigan or North Dakota. How much of the year will you be able to use the deck? The more months that the weather is suitable, the more it makes sense to build a single or multi-story deck. Let’s look at the pros & cons of elevated decks, starting with the bright side. Keep these potential drawbacks in mind. How Much Does it Cost to Build an Elevated Deck? The largest additional expense is in the labor because the crew will need equipment such as scaffolding to build the deck, and construction will be more time-consuming. Expect labor estimates to be approximately 10 to 25 percent more than for a deck built close to the ground. Now, what that looks like in real dollars depends on the material you plan to use. This table is based on the prices given in our deck guides with the increases for elevation of the deck. We’ll continue to add material types to our list of guides, so check back periodically to see what’s new. The elevation might make repairs more difficult, depending on what is done. In addition, repairs are always costlier than fresh installation because they are more time-consuming. While the material costs should be the same as above, expect to pay a premium of 20 to 35 percent on the labor costs per square foot. This elevated deck Q&A answers common questions. How will an elevated deck affect my home’s resale value? If the deck is properly planned and executed, it will be an asset to your home and increase its value. On the other hand, if the deck looks out of place, it will be seen as a detriment. Careful planning with a qualified contractor is very important in order to design and complete a deck that is beautifully integrated with both your home and the landscape of your yard. Why is the construction cost for elevated decks higher than for standard decks? Scaffolding might be needed to build the deck, and getting materials up to the deck requires more manpower. Are stairs required for elevated decks? In most cases, they aren’t needed, but it depends on the construction plan. Since codes vary across the country, our best advice is to talk to your local building codes office for the specific requirements of building an elevated deck. An experienced deck builder should also know the code requirements where you live. 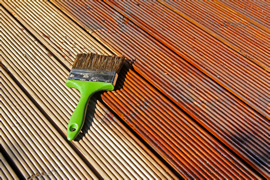 Looking for a Deck Installer or Deck Repair Pro? Elevated decks should be built and repaired by a contractor with experience. Looks, performance and safety are all jeopardized when the crew installing or repairing the deck isn’t skilled or experienced. We can help you find the balance you’re looking for, an experienced elevated deck builder at a reasonable price. Our service is free, and there is no obligation. The contractors are prescreened, and their estimates are competitive. Skip the hassle of finding a deck builder, and get free estimates from some of the top elevated deck contractors in your area. NADRA The North American Deck and Railing Association (NADRA) is to provide a unified source for the professional development, promotion, growth, and sustenance of the Deck and Railing building industry. Copyright © 2019 Deck Cost Guide.